As a historian of southern Africa, Luise White’s work spans, and often integrates the politics, and social and cultural history of the area. White, a professor in the UF history department, researches the renegade independence of Rhodesia (now Zimbabwe) from1965 to 1980. White says that Rhodesia’s war to defend minority rule and a way of life, was fought with twice as many regular African soldiers as white ones. White has already done extensive research in Zimbabwe, South Africa and in the Rhodesian army papers held in England, as well as the literary production during war years. 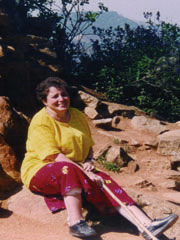 Her first book, The Comforts of Home: Prostitution in Colonial Nairobi, won the Herskovits Award of the African Studies Association for Best Book of 1991. “Luise’s work is widely respected within the profession, not just among Africanists, but also beyond the boundaries of her own geographical specialization,” says Brian Ward, chairman and associate professor in the Department of History.